Posted February 27th, 2015 by Jeremy Dalton. Do you want a home theater in Acworth, Alpharetta, Atlanta, Decatur, Kennesaw or Smyrna? If so you should visit ATLANTA ENTERTAINMENT SYSTEMS. They have all the latest and greatest stuff when it comes to home theaters, audio systems, home entertainment and related equipment and accessories. They will also do your home theater installation and manage your project from beginning to end. Your home theater installation is as important as the system itself. You don’t want second best. 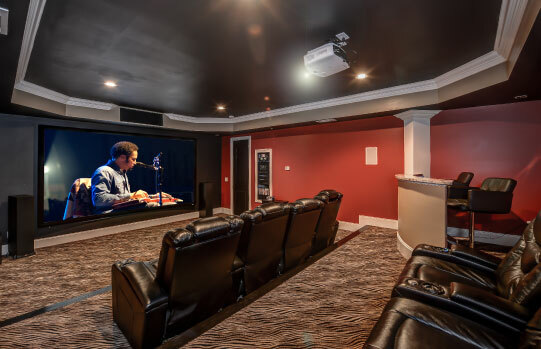 AES will do a custom home theater installation and this process starts with the selection of the right equipment, components, electronics, seats and related accessories. Since they have many years’ experience and are current with latest technologies, they will be able to put together the best possible home theater system to match your budget, your home and your preferences. With a custom home theater solution you will have a system that delivers perfect sound and audio and also complements and enhances the aesthetics of your home. This way you get an effective and hassle free solution that will reward you with pleasure and enjoyment for many years to come. Think of your home theater solution as a project. It is a big investment and you want it to be right. The audio video experts from AES will handle your home theater project from start to finish ensuring you get the best possible solution. Trying to install a complicated and integrated home theater system yourself won’t be any fun and you will make mistakes on important details. Not only will the experts install your system, they will also train you on how to operate your new system. Another good idea is enter into a service agreement with AES so they can ensure your system works perfectly and also remains current with technology.